When you click to add a new book, you’ll be prompted with a window that requests a fair amount of information. A lot of these items will be for ASIN, ISBN, and other service ID values. There is another help page specifically detailing how you can get each one of the items for the various services. You can find it by clicking this link. You may enter the book name exactly as you have it published or you can use an abbreviation if you prefer. It’s completely up to you. In order to see the book image on the books pages, you will need to input the Amazon ASIN. If this book has yet to be published on Amazon, you’ll see a black box with the title of the book written in text. ReaderLinks offers a MyBooks page that you can share with your readers. It’s essentially just a category screen that lists all of your books and all the locations they can be purchased (assuming you have input the various IDs for the book). Typically you will want this to be set as ‘No’ until the book has been published. 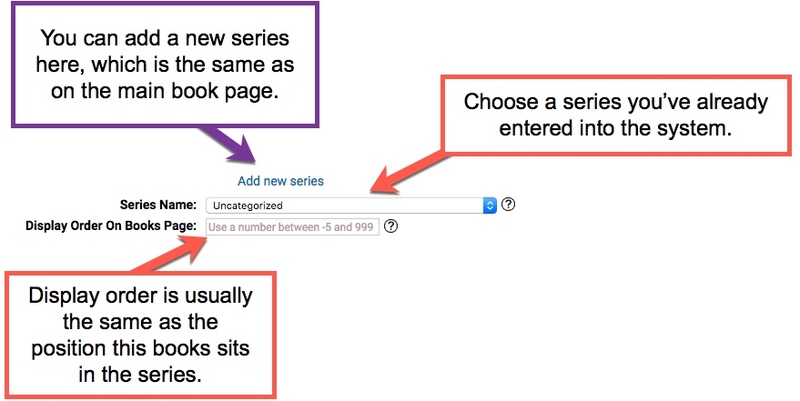 You can either add a series here or on the main books page. Alternately, you can just select an already created series name from the dropdown list. You should also set the book’s order in visibility. This is typically done by the sequence of the book in the series. So, book 1 would be 1, book 2 would be 2, and so on. Fill in all the information you have for your book. You can always come back later and fill in information as well. It doesn’t all have to be done immediately. For details on where to get the various identifiers, refer to the ASIN, ISBN, and Other Service IDs page. We currently only support one ISBN-10/ISBN-13 for paperback and one for hardback. One thing you can do is create Custom Links for your books. These are books that do not have geolocation or automatic affiliate code placement. But sometimes you’ll want to pass specific data to those Custom Links. What you can do is create a tag called [book] and then set it to ‘my-book-name-1‘. Next, when you create a new Custom Link, you would put mysite.com/[book]. ReaderLinks will search for [book] and replace it with ‘my-book-name-1‘. Sometimes you may not want to use Amazon Affiliate Codes for a particular book. 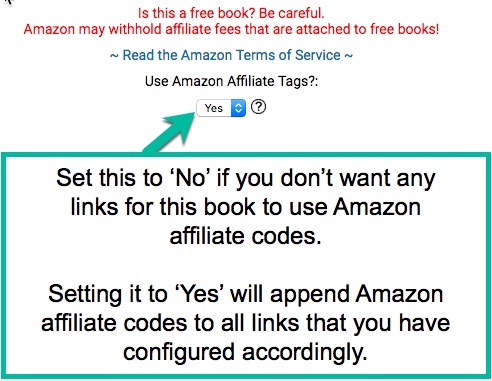 For example, if the book is free, you don’t want to use Amazon Affiliate Codes. This is because they may not pay you for the month at all since you may have given away more product than you sold. It’s best to read their Terms of Service, which is available above the Use Amazon Affiliate Tags? section. You can keep any notes you want to keep on this book. Maybe you want to store your Amazon categories and keywords here, for example.